The chelaled nature of this product aids absorption. Copper aids iron absorption, helping to form haemoglobin of red blood cells. Copper also helps convert amino acids into pigment, thereby adding colour to hair and skin. 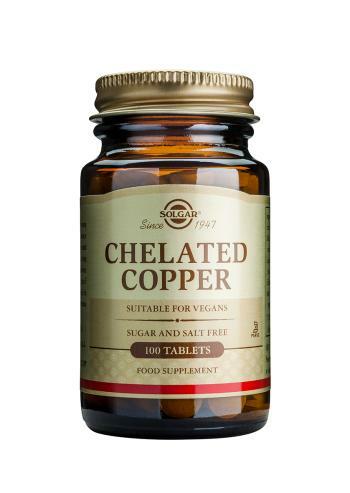 As a food supplement for adults, one (1) tablet of Solgar Chelated Copper daily, preferably at mealtime, or as directed by a healthcare practitioner. Tableted with these natural ingredients: dicalcium phosphate, microcrystalline cellulose, cellulose gum, magnesium stearate.